On Sunday the 8th of October, 9 people from Chapel Properties took part in a tandem skydive to raise money for the Cruse Bereavement Charity. Cruse Bereavement Charity provides help & support to people of all ages to cope with mourning when a loved one has passed away. 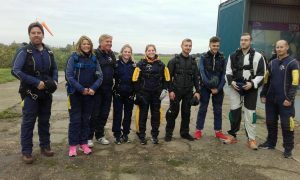 We would like to thank Aaron Sharp for organising this jump & to UK Parachuting for looking after us. 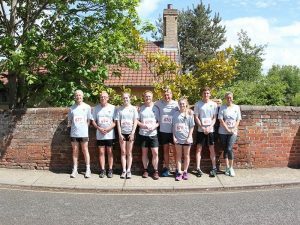 We entered a team of 8 into the Woodbridge 10k for the 2nd year running, Great fun was had before, during & after the race and we raised £750. We have donated a raffle prize of a weekend stay in a cottage in Woodbridge. It was greatly received & has raised £350 for Eyke Primary School.